Joe We're finally starting to recover from this year's bout of Post-Halloween Eating Disorder (PHED). Most years it's all the candy that really does me in, but this year there wasn't as much of that—unless you count the night of the pumpkin carving party, for which our entire dinner consisted of candy and beer. Instead, having spent way too much money on pumpkins, this year we ate Jack-O-Lantern for the better part of a week. Oh sure, there's always the roast pumpkin seeds, but that just wasn't going to cut it this time. Oddly, I can't seem to find winter squash in the local stores, so the pumpkins afforded us an opportunity to make a batch of pumpkin risotto with spinach and Italian sausage, a perennial favorite that we've been missing this fall. That was so good that we made a second batch when we had G. and D. over for dinner and cards that weekend. And of course, it wasn't bad just cut into chunks and baked, although that does get boring fast. 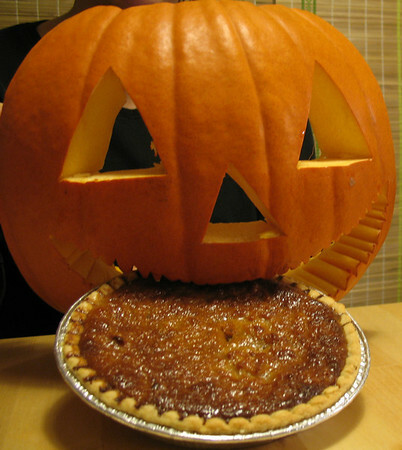 After all that, though, we still had a whole pumpkin left, so it was on to the pies. I've never made pumpkin pie before, but I've always heard that (1) you should just use canned pumpkin because actual pumpkin isn't worth the hassle, and (2) if you're going to use pumpkin, don't use carving pumpkins, because they're too watery and tasteless. A few minutes of searching turned up a website that disagreed with the first of these assertions, so I decided to give it a try. After baking the pumpkin, I mashed it up with a fork, put it in a colander, and then let it drain in the fridge overnight. The recipe suggested adding some additional sugar if not using pie pumpkin, but it also called for evaporated milk—an ingredient which does not appear to exist in Sweden—so I figured that my substitution of 2/3 sweetened condensed milk and 1/3 regular milk would make up for the difference in sweetness. Then I made a batch of my infamous All-Butter Pie Crust*, and soon there was delicious pumpkin pie. I made some small ones for us, took a big one to the National Dish potluck, another for Jennifer to take to work on "Cake Day" (don't worry, Devon, it wasn't an actual holiday), and then a couple more little ones for us. Lacking a blender of any sort, they were all a little chunky, but I think I like them that way. *The trick, it turns out, is to actually add the butter to the other ingredients, instead of cutting it up into little chunks, sticking it in the freezer for a few minutes to chill it, and then finding it again the next week. Who would have guessed?